So sorry for the amount of time that has passed since my last blog post. Guess I havent done so well with posting consistently every week this year! As usual life gets busy and it seems dreams get pushed aside only to remain dreams for a little while longer. And to add to my list of excuses, I've been hit with a bit of discouragement lately. Last week was a slow month (for sales), not just with my day job, but with Lisscat Creations as well. Trust me, I understand its hard for everyone right now, me included. I guess the part that is so hard is the possibility of disappointing others. Though a fun little card, the "Truth Hoots" card wasn't a big hit, and when I say wasn't a big hit, I mean it didn't hit at all. Last month we tried to raise money for my brother in law and his college ministry at Marquette Univ. I hated to tell him that the fund raiser didn't go so well. But enough of the excuses and not-so-happy posting...that was just a little dose of honesty that needed to be vented across the WWW. "The road to success is dotted with many tempting parking places" and "Nobody trips over mountains. It is the small pebble that causes you to stumble. Pass all the pebbles in your path and you will find you have crossed the mountain. " So I've been getting a lot of requests for affordable printed card sets with the same Lisscat Creations design....so here they are introducing the new 6pc card set "CATtitudes". 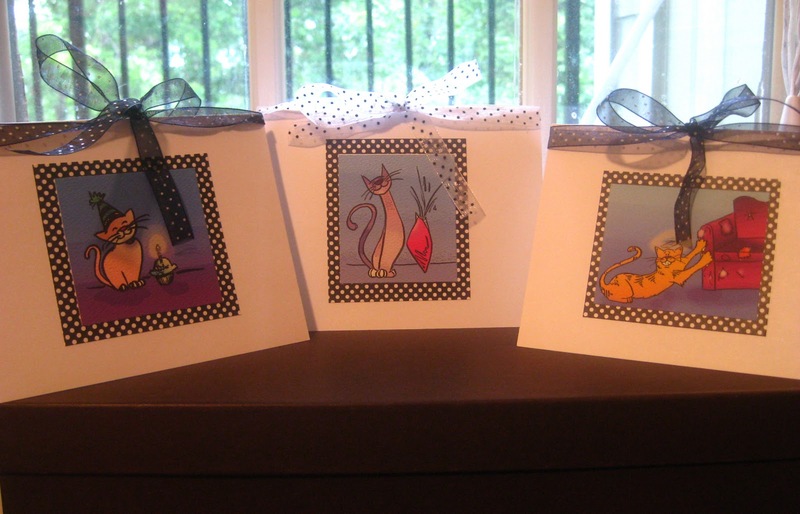 Each set comes with 2 of each design shown (6 cards total), and 6 envelopes, all for only $12.50. And as always, shipping is free, and 10% will be donated back to the charity of the month. This set can be purchased at here.